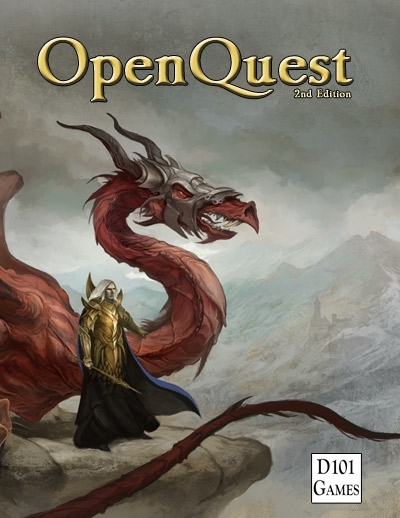 OpenQuest reminds me very much of Chaosium's RuneQuest 2. Not sure why. Maybe it's the lack of endless tables that RQ6 brought into the mix. In any case, OpenQuest 2 is the Deal of the Day. $7.50 in PDF, but that's not the sweet spot. $14.50 in color Softcover, $22.50 in color Hardcover. Both options come with the PDF. If I didn't already have it, I'd snag it. Is this one of the games where stats added together form the base percentages? Something like that. The Basic Role Play (BRP) is the underling system. Each flavor of it seems to tweak things a bit on how the skills are derived, and what skills there are. Also worth noting that during DriveThruRpg's Deal of the Day period, I've also marked down the print/pdf bundle at D101Games.com down by 50%, which means a hardcover from there is $12.50/£10 (UK residents also get free postage).